Lori Meghan Gallagher, JD is the Director of the Center for Irish Studies, which opened in January 2003 at the University of St. Thomas in Houston. The mission of the Center is (i) to preserve Irish heritage and culture, and (ii) to promote peace and reconciliation using the Northern Ireland model. Three times the Center has been named as one of the top 10 Irish Studies programs in the country by IrishCentral.com, published by Irish Voice newspaper in New York. In November 2010, the University named the Center in honor of William J. Flynn for his significant contributions to peace and reconciliation in Northern Ireland. As director of the William J. Flynn Center for Irish Studies, Ms. Gallagher oversees the interdisciplinary Irish Studies academic program, which consists of an undergraduate minor program and a graduate concentration in the Master’s in Liberal Arts program. The University offers five to six interdisciplinary Irish Studies courses each semester, including Irish history, politics, law and culture, literature, film, theology, music, and the Irish language. Her career at the University enables Ms. Gallagher to combine her Irish heritage and love of Irish literature, history, politics, and culture with her legal background. Ms. Gallagher is a lecturer at the University on Historical and Political Perspectives on Irish Law and Culture, Northern Ireland: Conflict and Peace, Irish Diaspora: The Irish American Experience, Contemporary Ireland: Society and Culture, and Law and Literature. Furthering her own interests in travel and broadening students’ horizons, Ms. Gallagher raises thousands of dollars in scholarships each year to lead University students to Ireland and Northern Ireland on study abroad and to host incoming students from Ireland and Northern Ireland to study at the University. Ms. Gallagher also organizes a monthly public cultural outreach series on Irish Studies topics, featuring nine to twelve speakers, scholars, and cultural performers from Ireland, Northern Ireland, and around the country each year. Since it opened in 2003, the Center has sponsored over 120 lectures, concerts, and other cultural performances open to the public and the University community. She is also a director of The Irish Society, a local cultural group that was instrumental in the creation of the Center for Irish Studies at the University and that co-sponsors many Irish cultural events with the Center. Before joining the University, Ms. Gallagher was the partner-in-charge of the Appellate Section of the prominent Houston- based international law firm of Andrews Kurth LLP. She practiced law full-time with Andrews Kurth for 18 years until she joined the University in 2002. During her practice, Ms. Gallagher was board certified in civil appellate law by the Texas Board of Legal Specialization. 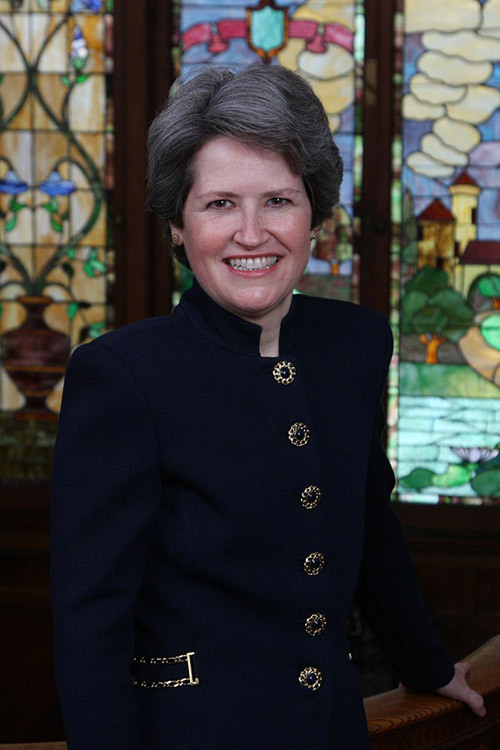 She is a past chair of the State Bar of Texas Appellate Section and a past chair of the Houston Bar Appellate Section. Ms. Gallagher is a fourth-generation Irish American whose family immigrated to America in the 1860s from Donegal. They settled in New Mexico, where they became cattle ranchers. She received her undergraduate degrees in English and Journalism, as well as her Juris Doctorate degree, from the University of New Mexico in Albuquerque. Ms. Gallagher was a member of Phi Beta Kappa as an undergraduate and the Editor-in-Chief of the New Mexico Law Review in law school. She received a postgraduate diploma in Anglo-Irish Literature from Trinity College, Dublin, Ireland, on a Rotary Foundation Ambassadorial Scholarship. She has been recognized by many leading Irish American organizations. Irish America magazine in New York named Ms. Gallagher as one of the 2009 “Global Irish 100,” a list of the “most revered and influential sons and daughters of Erin.” In 2009, she was selected as one of the first Texas Irish American Leaders by Irish Echo newspaper of New York and Belfast. Additionally, Ms. Gallagher was inducted into the “Irish Education 100” as one of the top Irish Educators in the U.S. and Canada by Irish Voice newspaper in New York in 2009 and again in 2014. She was also honored at the Mayor’s Ball for the 2009 Houston International Festival.